The Nexus 6P comes with a Snapdragon 810 designed by Qualcomm. This is a big.LITTLE 4x A53 @ 1.55GHz + 4x A57 @ 1.95GHz SoC. As we’ve hopefully come to be very familiar with the chipset over the last couple of months, the key characteristics with which the 6P can differentiate itself from other Snapdragon 810 devices is through software optimizations. In particular the fact that the Nexus 6P comes with Android 6.0 Marshmallow should allow it to be able to showcase some improvements which we’ll dive into a bit later. 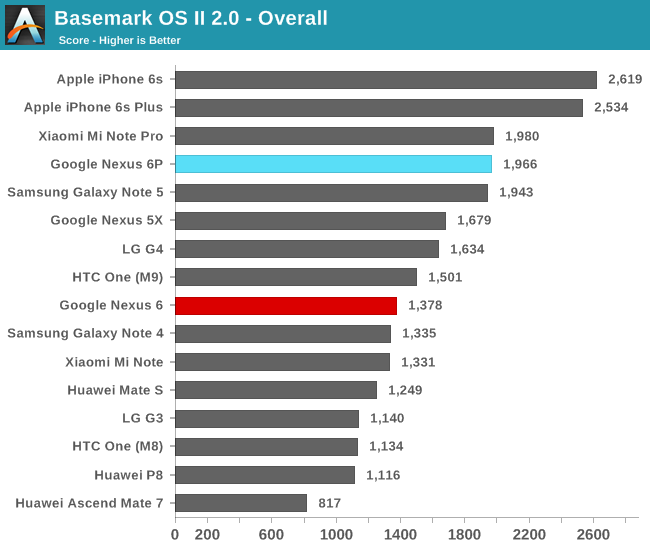 In Kraken the Nexus 6P is able to showcase a very good score that’s only beat by, oddly enough, the LG G4. As we’ve come to discover over the past year OEM browser libraries play a large role in device performance, even though we’re using the same Chrome build across different devices we see large differences in performance even within devices who employ the same SoC. It’s relatively unnerving to see this fragmentation in the ecosystem and in particular Chrome performing so differently across devices. 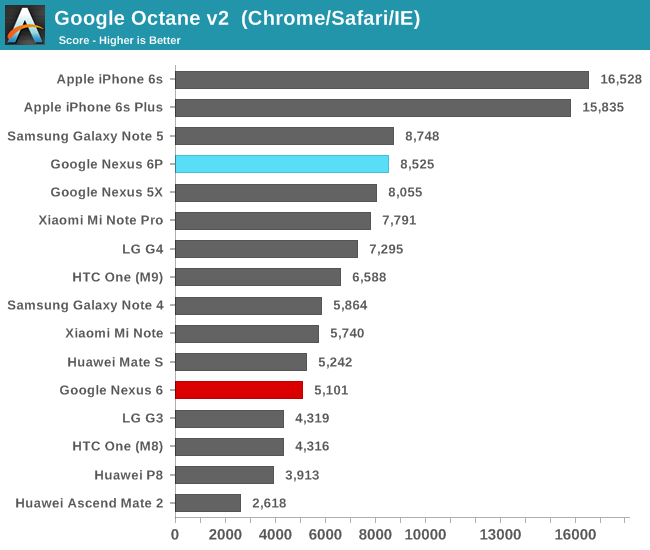 In Octane the Nexus 6P again performs very well, this time again beating our other devices such as the HTC One M9 or the Xiaomi Mi Note Pro. 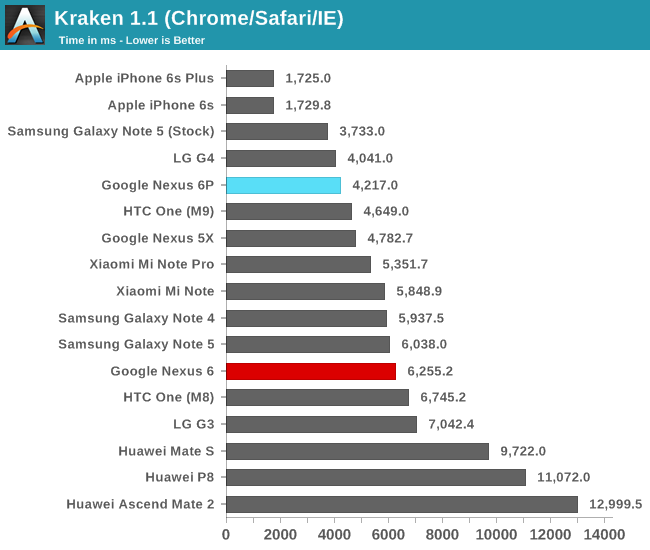 Among Android devices, only the Galaxy Note 5 - which on Octane is able to show equal performance as it does in its optimized stock browser - is able to beat it. 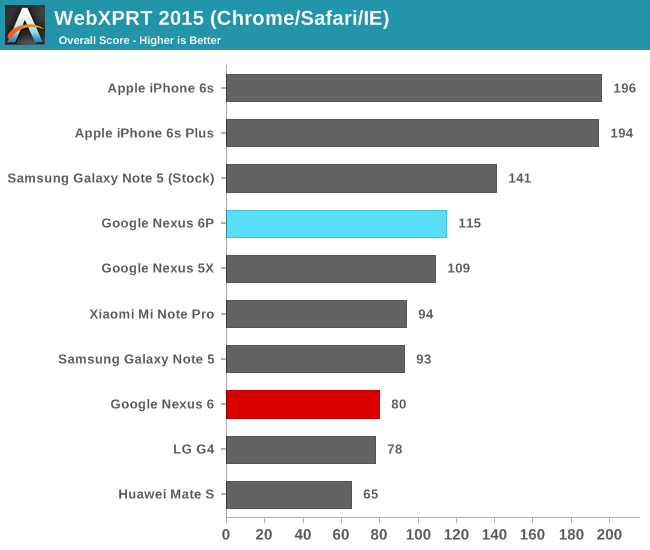 On WebXPRT again we see the 6P performs extremely well among Android devices, only being able to be beat by Samsung’s Exynos 7420 devices in the stock browser. 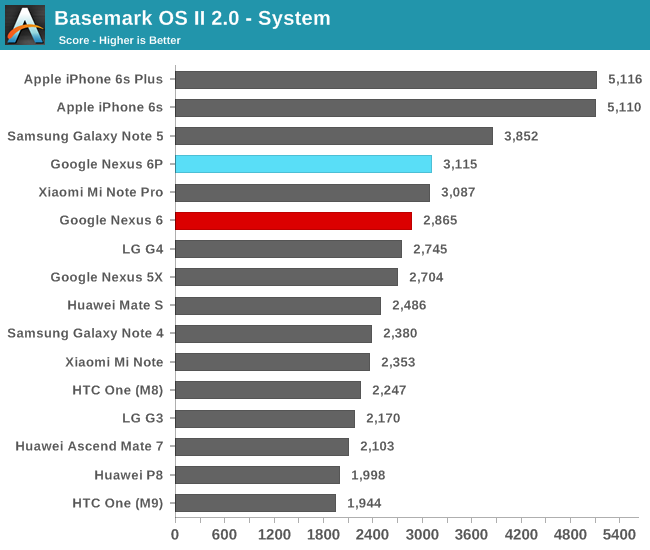 Continuing onto our system benchmarks, we start with Basemark OS II 2.0 from Basemark (formerly Rightware). 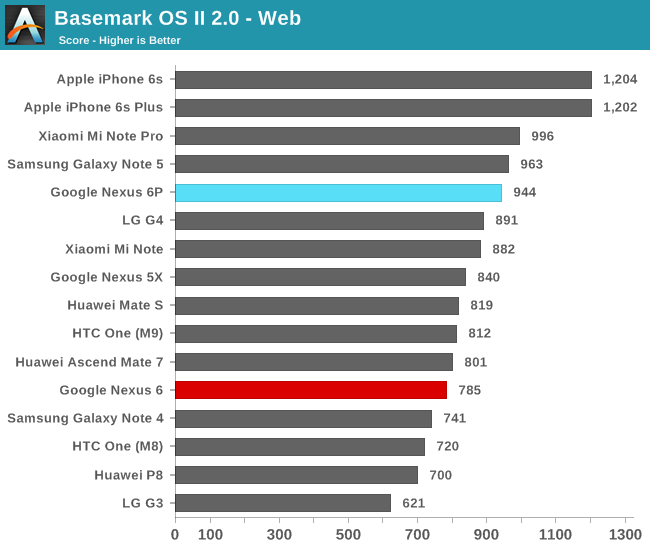 In the web test the Nexus 6P is yet again found at the high-end of the charts as it is able to provide good numbers. As we’ve seen in reviews such as on the Mate S it’s not necessarily raw performance that is demanded in these tests but also performance latency which plays a big role. 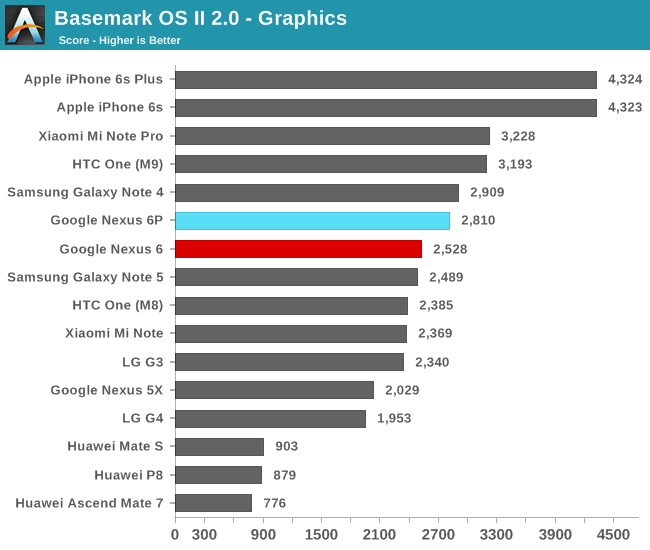 The graphics sub-test of Basemark has always been kind to the Adreno GPU so here again we see the Nexus 6P perform well, although not quite up to par with the other Snapdragon 810 devices we’ve tested in the past. 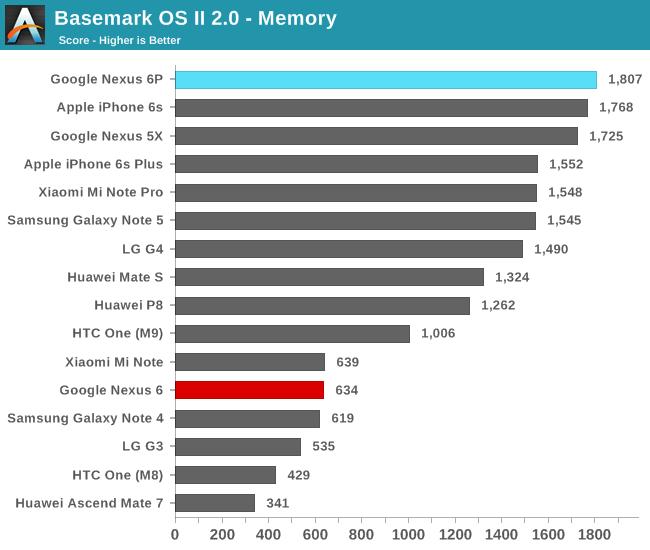 The Nexus 6P comes in a surprising first place on Basemark OS’s memory test. Again this is a mainly NAND-limited test but in contrast to our other synthetic test, performance and access patterns try to simulate more real-world applications. While the other tests try to test more realistic workloads, the system benchmark is all about measuring peak performance in a given set of scenarios. Here the Nexus 6P fares similarly to the Xiaomi Mi Note Pro but falls behind Exynos 7420 devices such as the Note 5. While I’m not a great fan of overall aggregate benchmark scores, we still see the Nexus 6P among the top of today’s currently available Android devices. Moving on to PCMark from Futuremark, we’ll use a suite of tests that not only try to mimic real-world usage patterns, but actually make use of APIs that we currently find in use by many day-to-day applications. Starting with the web browsing test we find the application use Android’s built-in WebView container which relies on OS-dependent components. 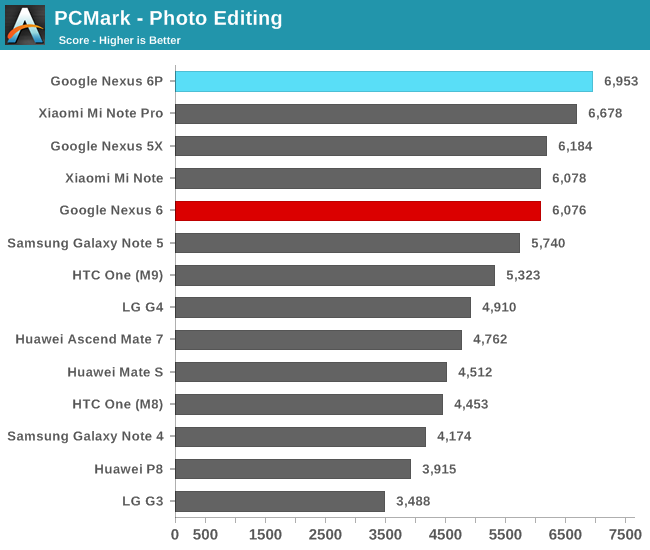 Here we see the Nexus 6P lead performance, slightly beating the Note 5. We’re also likely seeing advantages due to Android 6.0 as the Mi Note Pro, our other device with the Snapdragon 810 lags over a thousand points behind. 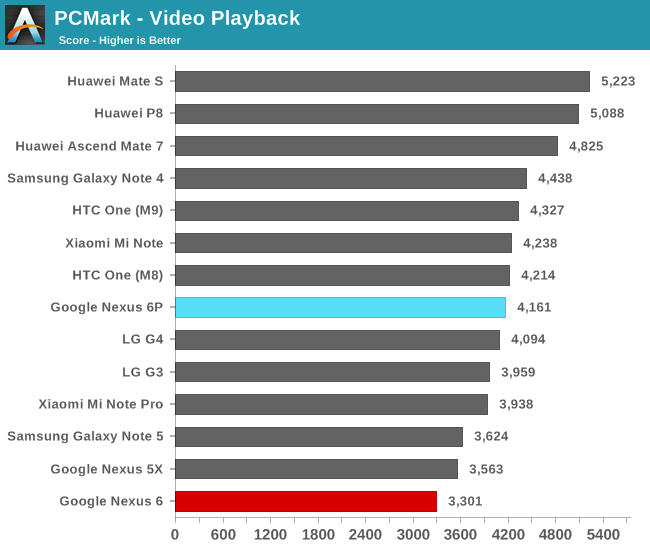 On the video playback score the Nexus 6P comes in towards the middle of the pack. The video test is a benchmark of both the video decoding hardware and software layers of the device, as well as the NAND speed, as fast seeking through the video is performed to test out how rapidly the device can resume playback. 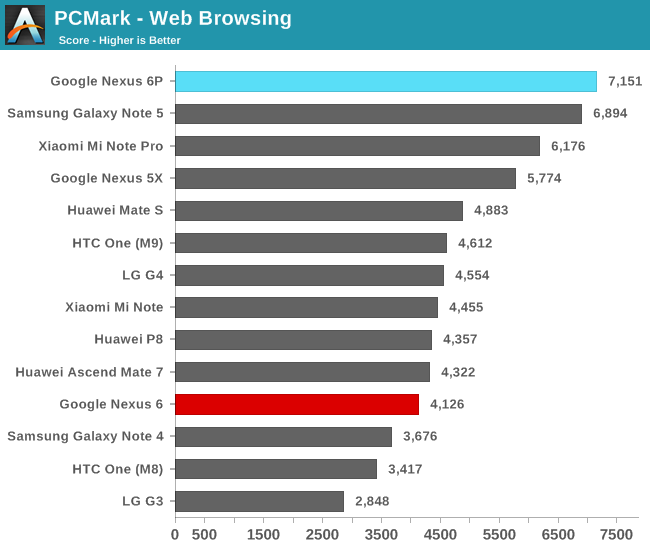 Now onto the writing test we come to one of the larger mysteries of the new Nexus 6’s performance. 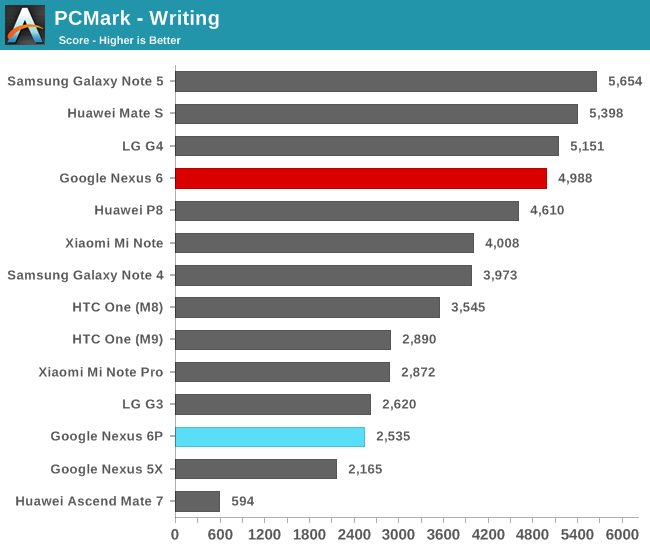 Both the Nexus 5X and the 6P seem to have large issues with PCMark’s writing test. The test itself consist of text manipulation and some file I/O, but most importantly it’s that this is purely a Java based test. Due to the way Android is architected, this means the code is handled and executed by the Android RunTime (ART). Futuremark have done a fantastic job in creating a test-case which is very sensitive to performance differences in the runtime. At first when seeing these scores I thought that this was a side-effect of Android 6.0’s new big.LITTLE optimizations (which we’ll get back to in a later section), but even after turning those settings off the scores remained the same. After testing some other Java-based benchmarks I came to the conclusion that this has to be a software issue. 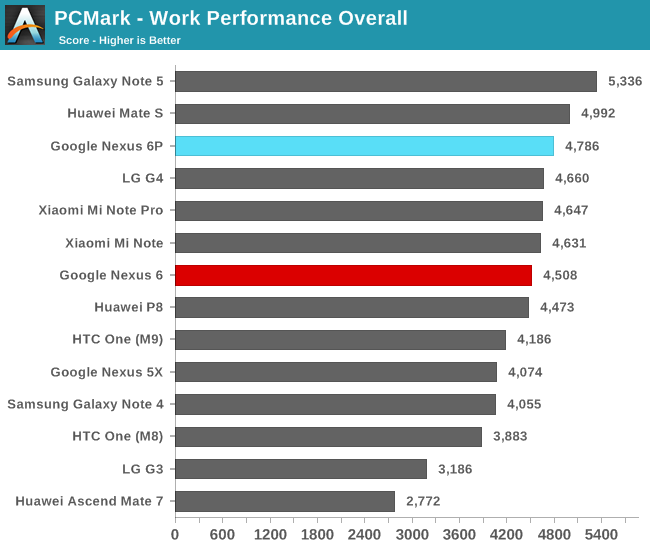 Due to the disappointing writing sub-score the Nexus 6P ends up third in the overall PCMark work performance score. Nevertheless, this is a good showing for the Snapdragon 810 device as it manages to slightly beat the Mi Note Pro and the HTC One M9. .... so you have more free space than your storage has? "I have 32GB model with about 40GB free." I think there's a flaw with this review display brightness readings. When I turn off adaptive brightness, then max out my brightness slider, I get 515 nits on an all white screen (in a dark room). But with adaptive brightness ON, and at maximum, it only reads 300 something nits.